This undated photo shows part of an apple branch being pruned in New Paltz, N.Y. The central-leader tree is shaped much like a Christmas tree, with a single leader — the trunk — flanked by shorter and shorter side branches moving up the tree. The open-center tree is vase-shaped, with three or four main limbs growing outward and upward. The modified-central-leader tree is a hybrid that starts as a central-leader, then becomes open-center. Once a fruit tree is mature and beyond the training stage, then pruning it well means striking a balance between shoot growth and fruit production. How to achieve this balance depends on how — or really, where — a particular tree bears its flowers and how big its fruits are. Especially with large fruits, such as apples and peaches, individual fruits tend to be undersize and less sweet with too heavy a crop. 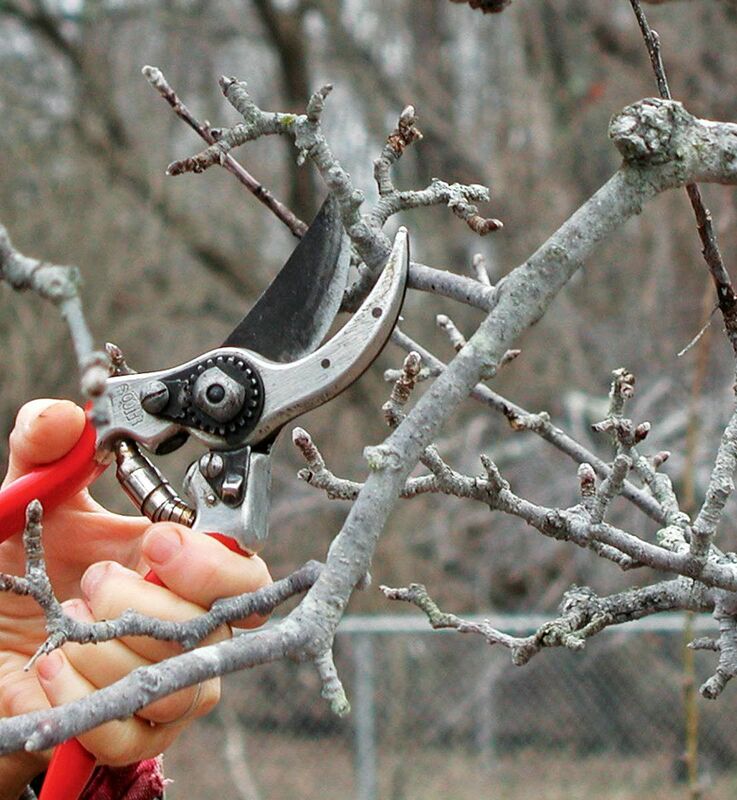 Pruning removes some potential fruits so the plant can pump more energy into those that remain. At one extreme are peach and nectarine. They bear fruit only on stems that grew the previous season, so they need fairly severe annual pruning to stimulate an annual flush of vigorous, new shoots for the following year’s crop. Prune enough so that a bird could fly right through the branches. Lee Reich, PhD is an avid farmdener (more than a gardener, less than a farmer) with graduate degrees in soil science and horticulture. After working in plant and soil research with the USDA and Cornell University, he shifted gears and turned to writing, lecturing, and consulting.